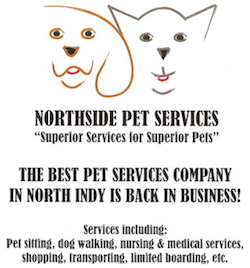 Northside Pet Services provides a wide variety of pet- related services in your home or ours. We can do everything from pet/house-sitting and dog walking to shopping and medical care. We are a superior SERVICE minded company with impeccable references. Most importantly, we LOVE pets! I have over 25 years of experience in the animal industry, with both domestic and exotic animals (from pocket pets to large mammals), in a variety of different venues. This variety has given me a deep understanding of both the physiological and psychological aspects of an animal, allowing me to approach each situation accordingly. I am a Registered Veterinary Nurse and I also hold a Masters Degree in Education. I also teach Science in Washington Township where I have been employed for 11 years. your pets. This knowledge, combined with an impeccable commitment to provide a standard of care, not only in regards to your pets but your home as well, and my veterinary medical background, enable me to provide the best pet care services available in northern Indianapolis. I only employ pet-sitters that I know personally who are committed to providing the same high quality of care that I do.